f0lio's main focus is elegance and ease of use. 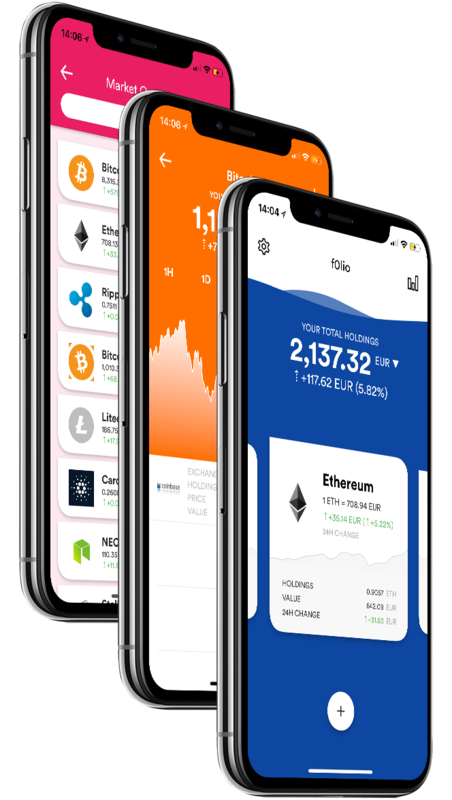 We believe we've designed an intuitive tool to keep track of the value of your cryptocurrency portfolio. Did we mention that the app is beautiful? Keeping track of your finances doesn’t need to be boring nor ugly. No matter where you are in the world, f0lio supports your local currency. Chinese Yuan? We got you! Hungarian Forint? You bet! Brazilian Real? It's there! Track all your spendings / gains and losses accurately, to the minute, across all exchanges. Keeping track of your cryptocurrency portfolio's value has never been so simple. Just add your holdings and watch your money grow. f0lio makes it easy to track coins even if you don't hold them. Check the "Market Overview" screen regularly to monitor the changes across the crypto world. One of the most requested features is coming in the near future: the ability to AUTOMATICALLY import your transactions using your public address or your API key from your favorite exchange. Receive updates from us, just type your email in the box.